Have you been asked to bring fruit to your next potluck meal? Forego the predictable grocery store fruit tray and bring this easy Fruit Salad with Lime Mint Syrup instead. Everyone loves fruit, right? It’s always a staple at any gathering. 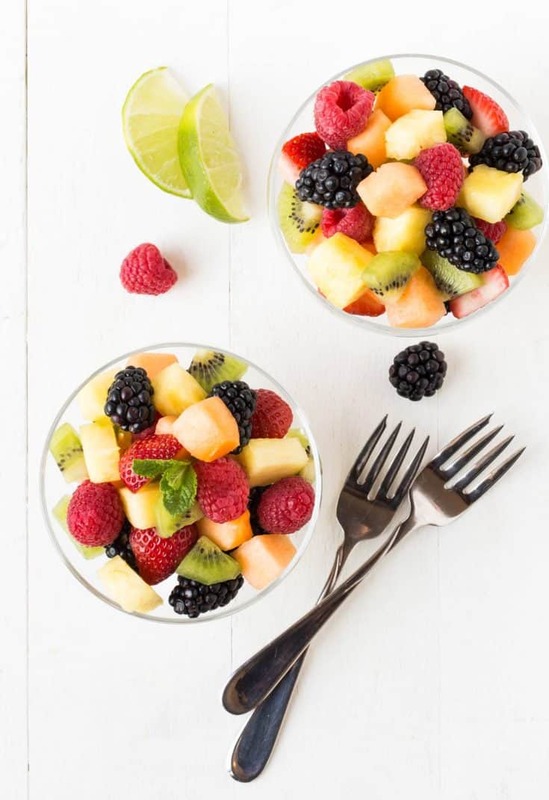 And while there are times when grabbing a precut fruit tray from the grocery store is totally warranted, spend a few extra minutes and prep this Fruit Salad with Lime Mint Syrup the next time you bring fruit to a party. Trust me; the unique addition of the Lime Mint Syrup turns the typical into something totally crave-worthy. Most fruit salads are extremely predictable. The biggest variation is usually the fruit itself, and that all depends on what looks good at the grocery store or farmer’s market that day. 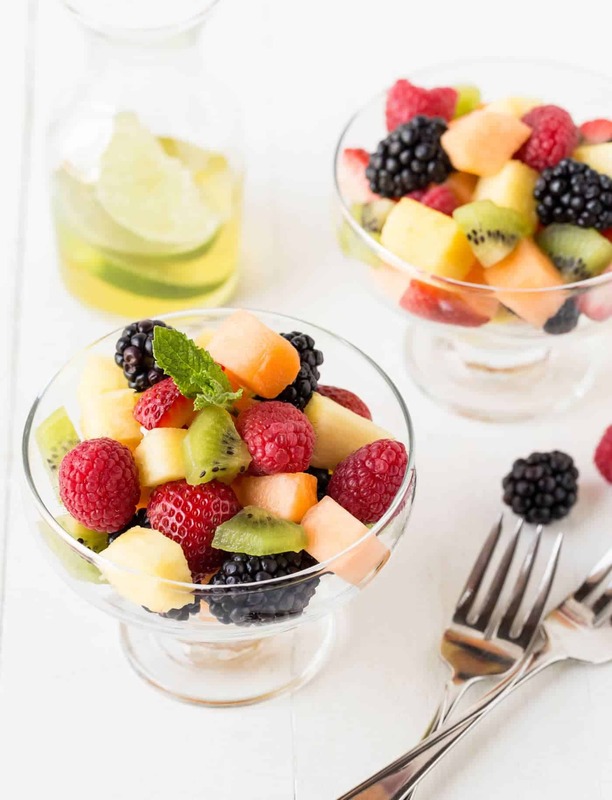 But this Fruit Salad with Lime Mint Syrup will leave guests scratching their heads and asking about the unexpected flavor from the citrus and herb sauce. The subtle lime mint flavor in the syrup is extremely complementary to almost any fruit. I usually try to toss in some kiwi fruit when I make this salad. I don’t always buy kiwi because it can be tart, but it achieves a perfect balance of sweetness and tartness with this herbal syrup. Tip: While I adore fruit salads, all the peeling, chopping, seeding and hulling the fresh fruit is always a bit of a chore. The strawberry huller makes life so much easier because I can give that job to the kids and not have to worry about someone injuring themselves with a paring knife. The Lime Mint Syrup is super easy to prepare (plus it can be stored in the fridge for up to two weeks – a great make-ahead option). Fresh mint leaves and lime rind are steeped in a simple syrup and strained so only the herbal notes of the mint and the zesty lime flavor remain. Cool completely and pour the syrup over the fruit right before serving. Then watch this “ordinary” Fruit Salad with Lime Mint Syrup disappear. P.S. Need to bring something else besides fruit to your potluck? Don’t miss our suggestions for How to Build a Better Veggie Tray and How to Build a Better Meat and Cheese Tray. Bring water and sugar to a boil in a small saucepan. Make sure all of the sugar has dissolved. Remove from heat and add mint leaves and lime zest. Let steep for 15 minutes and strain. Chill. Add fruit to a large bowl. Pour dressing over top and gently stir to combine. The lime mint syrup will keep in the refrigerator for up to two weeks. This came at the perfect time! I needed to bring a dish to a Memorial Day picnic. I made this and also brought your crostini with whipped feta. Both were huge hits! Thanks for the recipe. I will definitely be making this again. Hooray! Thanks for the comment, Rachel. Enjoy the rest of your holiday weekend! Wow..though the recipe looks simple but SURE its the first bowl gets emptied in every potlucks!! Your clicks are damn good!!! I am going to bring this to a Memorial Day BBQ. Is it possible to add the dressing to the fruit at home and have this hours later at the BBQ? Will this alter the texture of the fruit having it mixed in and not served immediately? Thank you for your help. Hi Maria, good question. Yes, you can add the dressing at home and then serve it at your BBQ. It might become a *little* syrupy after a few hours in the dressing, but use a slotted spoon to serve, and all should be good. Enjoy the holiday weekend! Wait, I only see questions marks for quantities of the first three ingredients. Can you update with the right amounts of each? Ah, thanks for catching this. We recently made a change to our recipe card function, and some of the data went missing during the migration. We’ve been checking as many recipes as we can, but this one was missed. All fixed now! Should the zest of the lime be grated on a micro planer or just put in in strips? Hi Maureen, I use my microplane grater to zest the lime. Enjoy!